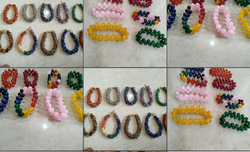 Manufacturer of a wide range of products which include 7 chakra reiki healing gemstone buddha breacelet, crystal ball, crystal pyramid, crystal pencil and pendulum. Have you curious known to benefits of the Crystal Gems tree? In this section, benefits of crystal ball are being described below. Let’s check it out. It is help to tell foretell related to your future.It is used in mentalism.The crystal ball play big role for foretell the future.To know what will be going in your future and which kind of problems you should be face.Foretell related to future point of view, the Crystal ball is very useful crystal. QUESTION: "Do you know how can we use the energy for pyramids for attraction? For example, if I'd like to attract love into my life? I would be very grateful Please advise as where to place it and what to do in order to attract Love (Soul mate & true friends)." MY ANSWER: Crystal and other types of pyramids are excellent tools for focusing energy, so they can be used to attract and manifest qualities or situations you want to have. To draw love or something else, gather a few simple materials. Gathered your materials in your sacred space and light your candle, sage or incense in the fireproof holder. Sit or stand comfortably facing the light/sacred smoke. Take three deep breaths, exhaling slowly, and state your initial intention to the Divine by whatever name you use, that you wish to perform this ritual so that the energy of the pyramid can help you attain your goal for the highest good of all concerned. Take the pyramid in your receptive hand (usually left, if you're right handed, and vice versa) and focus on your intention. Prevent "scatter" by choosing one goal at a time to attract. Trying to work with many at once diffuses the focus and can make the ritual and pyramid not work well for you. Spend a few minutes contemplating your exact goal. For instance, if the goal is love, what kind do you wish to attract? A loving soulmate spouse you can have children and a long life together, would be one. Loving friends, would be another. Be as specific as possible. If you feel akin confusion about it, ask the Divine and the soul of the pyramid to assist you in this. Once you feel that you are very clear on your intention and goal, set the pyramid in your lap or nearby. Write down your intention as specifically as possible and fold the paper into quarters. Pass the paper through the sacred smoke, or very carefully and quickly through the candle flame as you ask the Divine and the soul of the pyramid to attract this to you for the highest good of all concerned. 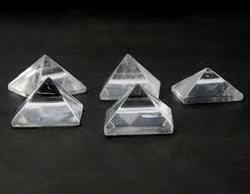 Place the folded paper under or inside the pyramid for it to continue to focus these energies toward your goal. Sit with the pyramid as long as you feel comfortable, then thank the pyramid and the Divine for their assistance. Extinguish any burning materials and leave the paper in or under the pyramid. You may leave the pyramid and paper in your sacred space, or move them together after this to a convenient location where you spend time, such as your bedroom where you sleep. Continue to work with the pyramid on a daily basis by reviewing by our intention as written on the paper and affirming to the spirit of the pyramid and Divine that this is your intention. Afterward, put them back. This is best done first thing in the morning or just before going to sleep. Repeat this daily until the pyramid has helped you attract your goal. Although I have slipped my healer pendulum around my neck for safe keeping and easy access during a hands-on healing session. This is a rainforest pendulum I use to measure auric flow and evaluate chakra functions. If your pendulum is made from gemstones, just know that crystal energies can be too overwhelming to comfortably wear next to your body. Some people are extremely sensitive to crystal vibrations. Crystal energies can feel too draining or, the opposite, too highly charged. But, the wearer may not realize it is actually the stone they are wearing that is causing them to feel out-of-sync. I own a few crystal pendant style necklaces made with various gemstones that could be used as a pendulum tool because of their shape. A favorite is a pale green fluorite crystal point that I will sometimes wear as a protective amulet to any absorb negative energies near me. Fluorite is extremely helpful to have nearby if you are going to be around someone who tends to spew out negative statements. It absorbs the negative vibrations so that I am better protected from any verbal barbs. Better to avoid being around these types of individuals, but sometimes it cannot be avoided. Also, be kind to your crystals by periodically clearing or cleaning them of picked up energies. There are some lovely blown glass and metal pendulums fashioned into pendants to be worn around the neck. These are actually small vials which can be used to carry essential oils. These are not meant to be used for divination... but could be I suppose. 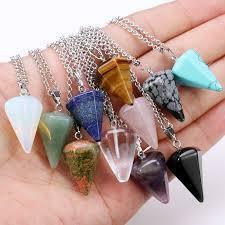 I prefer not to use pendulums made from gemstones as tools for divining information when working with clients. If a crystal pendulum is to be used as a healing tool for divination purposes then it is important to understand that crystals house healing properties. These energies could make possibly cloud the interpretation of the pendulum reading. Basically, the diviner would need to discern the outcome of the pendulum reading by first separating the nature vibration of the crystal apart from the message that the tool movement is trying to convey. This would be much like separating the yolk from the white of an egg. For this reason, whenever I use a pendulum as a healing tool, I find it easiest to employ a pendulum made from wood attached to a string rather than using a crystal pendulum dangling from a metal chain. 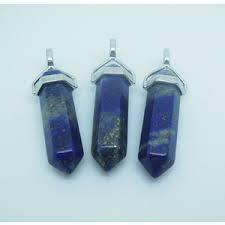 Metals also possess energies that can interfere with a pendulum reading outcome. Although wood also carries energetic vibes, it is more subtle than vibrations carried by crystals and metals.